“Jak Puraton Smriti, Jak Bhule-Jaoa Geeti/ Oshrubaspo Sudure Milak, Eso Hey Baishakh, Eso Eso…” or when loosely translated the song is calling for leaving behind old memories, songs, tears and welcome the new. The Bangalees will sing and dance to welcome the Bangla New Year 1426 with hopes it will usher in 12 months of progress and achievements on all fronts. Rich in culture, tradition and heritage, people of all castes, creeds and classes take mingle on this day with the identity of a Bangali which stands out as a symbol of harmony and secularism. The city people will start the day with the traditional breakfast of ‘panta bhat’ (soaked rice), green chili, onion and fried fish at Ramna Park, Suhrawardy Uddyan, Dhaka University Campus, Rabindra Sarobor at Dhanmondi and other places. Private parties will also be organized at homes and restaurants. Pahela Baishakh is celebrated in Bangladesh and some Indian states, including Paschimbanga, Assam, Tripura, Jharkhand and Odisha. Mughal Emperor Akbar introduced the Bangla year during his rule to facilitate tax collection from 1556 to1605 AD. 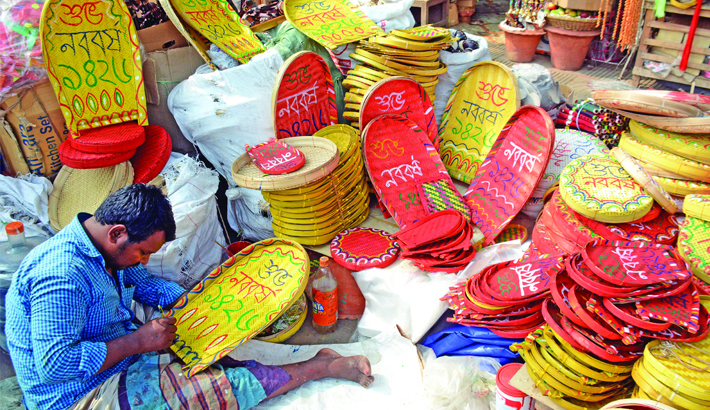 Thus as a tradition, businesses across Bangladesh, especially in the countryside will realize dues from their customers and open new account registrar known as Halkhata on the occasion of Pahela Baishakh. The most attractive part of the day is the play of colours with men, women and children marching on the Dhaka University campus in what is known as “Mangal Shobhajatra,” a march for the good of all, organized by the students of Fine Arts Institute as part of the annual ritual. On 30 November 2016, the United Nations Educational, Social and Cultural Organisation (UNESCO) recognised the Mangal Shobhajatra as a cultural heritage, which has added more importance to this festive day. The marchers will not wear masks this time in line with police security orders, but will carry them along with birds of various kinds. Pahela Baishakh draws the maximum number of revelers and will be celebrated across the country today amid festivity and traditional gaiety, pledging to build together a prosperous nation. The three hill districts of Rangamati, Khagrachari and Banderban have their own traditions to welcome the new years. There is a unique choice of colour for dresses for this occasion. This year, according to fashion designers, is red and white mainly, while some have chosen golden shades. Lipi Khandaker, who owns Bibiana, told the daily Sun that on this day most designers try to present traditional designs. “I have chosen red and white mainly to go with my theme “Bangalir Alapana” and the responce from the buyers is very good,”she said. The celebration will begin in the capital with the first light appearing in the sky amid Chhayanaut’s flagship New Year programme under an age-old Banyan tree or the Batamool in the Ramna Park. Musical rendezvous of Chhayanaut will begin at around 6 am and continue for around two hours. The programme will include solo songs, chorus and recitations. President Abdul Hamid and Prime Minister Sheikh Hasina in separate messages wished all a very happy and prosperous Bengali New Year 1426. The premier will exchange greetings with the members of her ruling AWami League as well as other political, social and cultural bodies along with government officials. The government will do everything possible for the smooth celebration of Pahela Baishakh across the country, Home Minister Asaduzzaman Khan said on Saturday. “The law enforcing agencies are now ready to face any sort of challenge,” the home minister told journalists after evaluating security measures at Ramna Park. As the main programme will be held in the capital, Dhaka Metropolitan Police (DMP) has deployed huge cops and installed CCTV cameras to ensure foolproof security in and around the celebration venues. Besides, Dhaka University authorities and different departments have chalked out elaborate programmes to celebrate the day.